Al Jazeera Network is to make some of its Arabic and English video footage freely available online for sharing and reuse by viewers and other broadcasters. 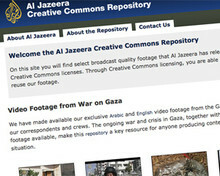 The film clips will be licensed under Creative Commons, the non-profit sharing system designed to protect creators' work online, and posted for use on the Al Jazeera Creative Commons Repository site. It is the world's first ever 'repository of broadcast-quality video footage' to be released under the most permissive licence available - the Creative Commons 3.0 Attribution licence - which allows for both commercial and non-commercial use, a statement on the Creative Commons website said. Starting with footage of events in Gaza, content will be free for downloading, sharing, remixing, subtitling and eventually rebroadcasting by users and TV stations across the world, as long as they acknowledge Al Jazeera as the source. "With the flexibility of the licence [the most permissive Creative Commons licence], we expect to introduce our outstanding coverage to an even wider audience across the world. This means that news outlets, filmmakers and bloggers will be able to easily share, remix, and reuse our footage," Mohamed Nanabhay, head of new media at Al Jazeera, said in the release. The broadcaster already has a strong presence on video-sharing site YouTube, and recently signed a deal with online TV broadcaster Livestation.